Meals cooked by our Rajasthani Maharaj. Arrive Bangkok’s Suvarnabhumi International Airport & proceed for Immigration followed by baggage collection & customs. Meet our Representative at arrival and proceed to Pattaya. Enroute enjoy breakfast at Sriracha Tiger Zoo and enjoy the Tiger and Crocodile Show. Later proceed to Pattaya by Road (approx. 45 mins Drive). Arrive & proceed for Lunch Free time for rest. Evening enjoy Alcazar Show. Overnight at hotel. After English breakfast proceed to most beautiful Coral Island by Speed Boat, Experience most Thrilling Parasailing Ride (Included in Tour Cost). Free time to enjoy swimming & other activities on Beach. (Note: Other Tour Operators Charge Extra for Parasailing). Proceed for Lunch. After Lunch, visit World Famous "Nong Nooch Village" Experience Thai Cultural Show & Most Thrilling Elephant Show (Included in Tour Cost). Overnight at hotel. After breakfast check-out Pattaya & proceed towards Bangkok by Road (2 Hours), en route visit Biggest Gem & Jewellery Factory. 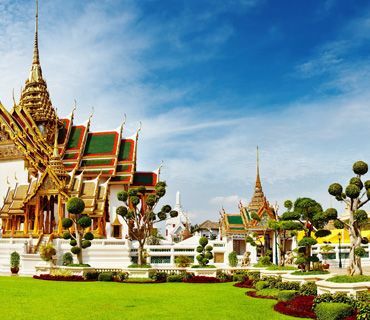 On arrival at Bangkok visit Golden Buddha, Reclining Buddha & Orientation Tour of Bangkok City. Proceed for Lunch. Check in at the hotel and rest of the day free for rest/shopping at your own. Overnight at hotel. After English breakfast proceed for full day tour of Safari World with Marine Park. Enjoy Orangutan Show - Sea Lion Show Hollywood Cow Boy Stunt Show - Mini World Dolphin Show & Open Zoo (All included in Tour Cost). Enjoy Indian Lunch prepared by Safari World Kitchen. Drop at Bangkok's Famous Shopping Hub "M.B.K Mall". Enjoy shopping on your own & return back to hotel at your time (before dinner time) by local taxi at your own cost(As Coach Parking is not allowed). Enjoy Dinner prepared by our Rajasthani Maharaj. Overnight at hotel. After breakfast proceed for full day tour of Siam Water Park. Enjoy Various Rides at Siam Water Park (Both Dry & Wet Park Rid es Included). Enjoy packed lunch prepared by our Maharaj. Drop at Bangkok's Famous Shopping area "Indra Market". Enjoy shoppi ng on your own & return back to hotel at your time (before dinner time) by local taxi at your own expense (As Coach Parking is not allowed). Enjoy Dinner prepared by our Rajasthani Maharaj. Overnight at hotel. After breakfast, check out and proceed to airport to board your flight back home. End of Memorable Tour conducted by Heena Tours & Travels. Daily 100% Gujarati/Jain Lunch & Dinner from Heena’s Private Kitchen at Thailand. All main sightseeing as per itinerary. Any increase in accommodation charges prior to departure. Excess baggage charge (Minimum 20 Kg Baggage allowance permitted by Airline and Coach, anything addition is chargeable and have to be paid directly). Any items not mentioned in TOUR COST INCLUDES.